Over the past few years Callaway has been making great strides in the golf ball market. It now offers golf balls for practically any handicap imaginable, and has great quality golf balls that are played by the likes of Phil Mickelson and Ernie Els on the PGA Tour as well. One of the more recent high-end golf balls that has come out is the Callaway Tour iS golf ball. It has received a lot of hype since it has come out, being featured on Golf Digest’s Hot List for 2011 for instance. The Callaway Tour iS is technologically advanced as a four piece golf ball (I guess three isn’t good enough these days or something) and its main purpose is to help golfers with their short games. Along with most of their other golf balls the Callaway Tour iS has HEX Aerodynamics; this means that when you look at the golf ball the dimples are hexagons instead of regular circles. This supposedly makes the ball better able to get good ball flight in practically any weather condition imaginable. Another feature concerning the Callaway Tour iS is its dual core technology, which is pretty self explanatory in which the golf ball has two cores (hence being a four piece golf ball instead of three piece), and it supposedly help in getting maximum distance along with great short game feel. With all of that said, does all of this technology in a golf ball really help your game? I decided to give the Callaway Tour iS a try over a few rounds to see if it can really live up to its hype. What follows is my review of the golf ball. As far as the short game, the ball lives up to its hype; it is truly a great short game ball that can rival any other brand on the market today. Especially from 100 yards and in the golf ball checks up beautifully and provides a good amount of backspin when needed. When it came to chipping bump and runs were very easy to execute and the Callaway Tour iS checks up every time. It was even great out of bunkers too. As anyone knows it can be quite difficult getting a golf ball to stop on the green when hitting a greenside bunker shot, but I was able to consistently get the ball to stop on the green; the same applied to fairway bunker shots as well. When it came to putting the golf ball felt great and rolled true every time. It certainly provides added confidence when putting on the green. The Callaway Tour iS is a really great ball to shape shots with, whether it is a fade, a hook, or even a riser (where the ball starts low and increases height). I just used the appropriate swing for each shot and the golf ball did the rest for me. I got some pretty good distance out of the fairway woods and driver, and I would it was comparable to similar golf balls. The major downside for the Callaway Tour iS came in regards to long iron shots (5 iron to 3 iron). The distance that I got for this kind of shot was well below average (about 5 yards shorter than a Pro V1). I play from the back tees and 5 yards means a lot, so I pleasantly surprised to find this out. The Callaway Tour iS certainly lives up to its hype as a great short game ball. I would say that it is a great fit for someone who already gets good distance and is looking to improve their short game stats. The only downside that I found when using the ball was long iron shots, but other than the Callaway Tour iS performed very well. Take a look at some more great deals on new and used Callaway Tour iS Golf Balls. If you’re looking for a new driver to change up your game, take a look at this deal on a Callaway FT-IQ 11 Degree Driver with a regular flex shaft. 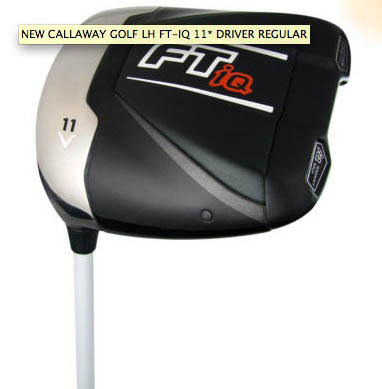 The FT-iQ Driver advances the revolutionary ideas that went into the FT-i Driver to become the straightest driver Callaway Golf has ever made. This regular flex shaft and high 11 degree loft caters towards beginner golfers and the price is just right at $99 on eBay with free shipping. Take a look at some more great deals on new and used golf drivers.